You are on a bus when you think of it as transport. You are in a bus when you think about the inside of it. 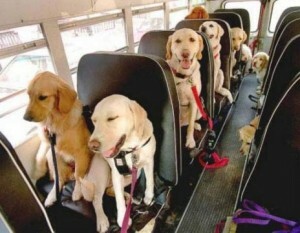 The are seven dogs in the bus. • I am on a bus with my dogs. We will be with you soon. • I left my bag in the bus. • By next week I will be on my boat, relaxing with a cocktail. In the boat there are three cabins. If the transport you are talking about has only four wheels, a car or a taxi for example, don’t use on. Use only in. • I am in a taxi. NOT I am on a taxi. • I left my bag in the car. Remember: On transport. INside the object. When thinking of transport do we use on or in with the following? Complete the sentences using either in or on. Shall we go ___ your car or mine? Shall we go (in) your car or mine? Shall we go in your car or mine? Transport with four wheels is always in. Bruce is ___ the train now, so he should be here in about an hour. Bruce is (on) the train now, so he should be here in about an hour. Bruce is on the train now, so he should be here in about an hour. I go to work ___ my bike almost every day. I go to work (on) my bike almost every day. I go to work on my bike almost every day. I left my phone ___ the tram. I left my phone (in) the tram. I left my phone in the tram. In because we are thinking about the inside of the tram, not the tram as transport. I’m not hungry – I had a meal ___ the train. I’m not hungry – I had a meal (on) the train. I’m not hungry – I had a meal on the train. The dog is asleep ___ the car. The dog is asleep (in) the car. The dog is asleep in the car. My office is on the fifteenth floor, but you will be able to reach me ___ the lift. My office is on the fifteenth floor, but you will be able to reach me (in) the lift. My office is on the fifteenth floor, but you will be able to reach me in the lift. We walked to the beach, but came home ___ a taxi. We walked to the beach, but came home (in) a taxi. We walked to the beach, but came home in a taxi. She has never been ___ a horse in her life. She has never been (on) a horse in her life. She has never been on a horse in her life. Travelling ___ a balloon is both scary and amazing. Travelling (in) a balloon is both scary and amazing. Travelling in a balloon is both scary and amazing. The stewardesses ___ the plane were very nice. The stewardesses (on) the plane were very nice. The stewardesses on the plane were very nice. 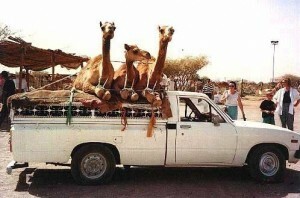 There are three camels in the car. I will help you get in the train.